If you are interested in the low-carb, moderate protein, high-fat, ketogenic diet, then this is the podcast for you. We zero in exclusively on all the questions people have about how being in a state of nutritional ketosis and the effects it has on your health. There are a lot of myths about keto floating around out there and our two amazing cohosts are shooting them down one at a time. 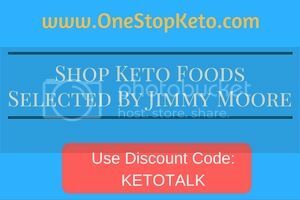 Keto Talk is cohosted by 10-year veteran health podcaster and international bestselling author Jimmy Moore from "Livin' La Vida Low-Carb" and Arizona osteopath and certified bariatric physician Dr. Adam Nally from "Doc Muscles" who thoroughly share from their wealth of experience on the ketogenic lifestyle each and every Thursday. We love hearing from our fabulous Ketonian listeners with new questions--send an email to Jimmy at livinlowcarbman@charter.net. And if you're not already subscribed to the podcast on iTunes and listened to the past episodes, then you can do that and leave a review HERE. Listen in today as Jimmy and Adam continue answering YOUR questions about nutritional ketosis in Episode 41. They say in the column that “if you've been considering the ketogenic diet, think again.” It looks to be mostly erroneous, but they make one point about weak bones from the ketones pulling phosphorus and calcium out of the bones that I've never heard about before. Here is the paragraph where they discuss this: "Weak bones and stress fractures happen because ketones are acidic and one of their jobs is to pull phosphorous and calcium out of your bones. When ketones are your sole source of energy, you have a buildup, and thus, you deplete your phosphorous and calcium. This can lead to stress fractures and bone problems." Do you guys have any thoughts about this? 1. Why did I experience more anxiety when I started on the ketogenic diet? After hearing Tim Ferriss talk about using keto for Lyme disease, that made me want to give it a try. I dove right into the diet and was sleeping amazingly well the first few weeks which ran counter to what I had heard about getting into ketosis. But there was one problem that reared its ugly head: ANXIETY! I found I was much more anxious all day, everyday while in ketosis and it became way too much for me to handle. So I returned to my lower-carb, but not ketogenic diet and the anxiety stopped…but then my sleep wasn’t great anymore. I’m frustrated and struggling with my weight again. So what about the anxiety I experienced eating keto? Does this typically happen to people on this way of eating and is there anything I can do differently in the future if I decide to try it again. I'd love your insights because I have no idea who else to ask! 2. Do the calories from ketones spilled over in the breath and urine account for weight loss on a ketogenic diet? Has anyone ever quantified the caloric value of ketones that are lost in the breath and urine over the course of a day. I’ve been thinking a lot about this lately and my theory is that perhaps the weight loss that happens on the ketogenic diet is not due to burning more calories but rather simply due to spilling them out in the form of ketones. The analogy that comes to mind is how the mileage of a car drops as it spills hydrocarbons in the exhaust. What do you think? 3. Can an allergic reaction directly impact your blood ketone levels? It seems that my blood ketones drop significantly from 2-3 mmol down to 0.5 or less when I have an allergic reaction. Would an allergic reaction from hay fever or asthma, for example, that comes with an inflammatory response impact my ability to be in ketosis? Is it due to histamines or does the reaction to allergies lead to an insulin surge that lowers the ketones? Are there any studies in this area? After reading into the new nutrition label updates from the FDA, a few links later and I found myself casually browsing the attached government page providing the recommendations for the consumption of carbohydrates. It’s really illuminating stuff to me. But I became concerned when I read they claim we need 130 grams of carbs a day "to provide the brain with an adequate supply of glucose." This has left me worried about my intake of carbs which is less than half of that. Do we really need 130g of carbs a day? What are the negative effects of not reaching this daily intake? Could I maintain ketosis at that level of carbohydrates to fulfill this requirement? Please help me understand this. If you are interested in the low-carb, moderate protein, high-fat, ketogenic diet, then this is the podcast for you. We zero in exclusively on all the questions people have about how being in a state of nutritional ketosis and the effects it has on your health. There are a lot of myths about keto floating around out there and our two amazing cohosts are shooting them down one at a time. Keto Talk is cohosted by 10-year veteran health podcaster and international bestselling author Jimmy Moore from "Livin' La Vida Low-Carb" and Arizona osteopath and certified bariatric physician Dr. Adam Nally from "Doc Muscles" who thoroughly share from their wealth of experience on the ketogenic lifestyle each and every Thursday. We love hearing from our fabulous Ketonian listeners with new questions--send an email to Jimmy at livinlowcarbman@charter.net. And if you're not already subscribed to the podcast on iTunes and listened to the past episodes, then you can do that and leave a review HERE. Listen in today as Jimmy and Adam provide more in-depth answers to your ketogenic questions in Episode 39. - Will I ever get to eat "normal" so I can have carbohydrates again? I just went on a full binge and listened to all of your Keto Talk podcasts within 2 days! You guys are great with a perfect balance of humor and lots of science without being biased. I am now a firm believer and follower of you guys. I am completely new to keto and have never felt better in my life. I just got done detoxifying from black mold so my brain loves all the healthy fats to make me preform at optimal levels and my sugar cravings are nearly gone. I will be ordering your books soon to get recipes and also understand this way of eating even more. But I have a question for the show. I would like to have a "normal" lifestyle where I can eat carbs again from time to time. I have heard the great benefits of going full keto all the time, but I am a believer that you should always vary your diet and have other inputs so your body understands other things and doesn't explode when you eat a cake. If I want to keep carbs as an option should I go the full 8 weeks to get fully keto-adapted and then slowly put them back in? Or should I be introducing carbs back into my diet sooner so I never go full keto? I want to still be able to run on gasoline from time to time, but prefer diesel for the long haul. Is what I’m describing okay? Thank you guys for being so amazing and interesting to listen to and helping me find the diet I’ve been looking for my entire life! 1. Do you have to do keto differently if you take medications for hypothyroidism? I just found your entertaining and informative Keto Talk podcast. Thank you both for taking the time to share your knowledge with us. I am very new to keto but I do understand the process. My question is about going on a ketogenic diet while on thyroid medication for hypothyroidism. Does the way you approach keto differ in this situation compared with those who are not taking medications? Thank you and I look forward to your podcasts each week. 2. Is there something missing in my ketogenic diet that makes me bruise more easily? Hi Jimmy and Dr. Nally! I have been trying to do keto for a few months now. Some months are easier than others. Since going low-carb/keto I have noticed that I have random bruises show up and I seem to bruise more easily. What key nutrients and minerals could I be lacking in my diet that could be causing this? And what supplements do you suggest taking to prevent this? Thanks so much! I love listening to all of your podcasts. Both you and Dr. Nally are so helpful and informative! 3. Does it take longer for women to lose weight because of hormones when they go ketogenic? I was listening to your LLVLC Show podcast with Dr. Robert Cywes who mentioned the difference in men and women with a ketogenic protocol. He explained how men typically drop lots of weight at first and then level off while women have a slower start, regulate their estrogen levels, and then over time, start to increase weight loss. I wonder if Doc Nally has any thoughts on this progression for women or if he's seen that in his practice? I’ve been keto for a few months and the weight is stalled a bit. I’m trying not to freak out. Thanks for your great show! Thanks for the great podcast. I recently discovered you guys and I’m methodically making my way through all the episodes. I have been on a ketogenic diet for a few months now and have lost 10 pounds so far. I measure my ketone levels using the Precision Xtra meter and regularly measure between 2.5-4.5 mml/L. I recently bought the Ketonix breath ketone device and have started using it as well. I wanted to see if you guys could touch on the overall differences between these two methods of ketone measurement. I have heard that Ketonix is supposed to correlate pretty closely to the Precision Xtra. But how is this possible since they measure two different ketone bodies. 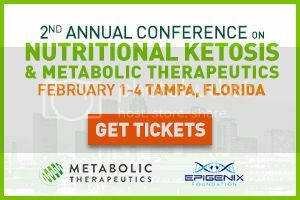 Can you give a range you would consider good for someone who is in nutritional ketosis when measuring with the Ketonix? Thanks much and keep up the great work. If you are interested in the low-carb, moderate protein, high-fat, ketogenic diet, then this is the podcast for you. We zero in exclusively on all the questions people have about how being in a state of nutritional ketosis and the effects it has on your health. There are a lot of myths about keto floating around out there and our two amazing cohosts are shooting them down one at a time. 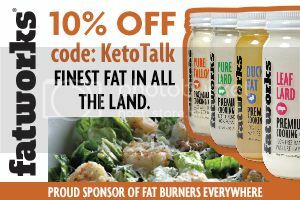 Keto Talk is cohosted by 10-year veteran health podcaster and international bestselling author Jimmy Moore from "Livin' La Vida Low-Carb" and Arizona osteopath and certified bariatric physician Dr. Adam Nally from "Doc Muscles" who thoroughly share from their wealth of experience on the ketogenic lifestyle each and every Thursday. We love hearing from our fabulous Ketonian listeners with new questions--send an email to Jimmy at livinlowcarbman@charter.net. And if you're not already subscribed to the podcast on iTunes and listened to the past episodes, then you can do that and leave a review HERE. Listen in today as Jimmy and Adam give more answers to your questions all about keto today in Episode 38. 1. Should I ignore my body fat percentage if all my health markers are superb while eating keto? Hey guys, I love Keto Talk and hope you can help me with my question. Here it is: How important is my body fat percentage number? Both my parents died in their 70s of heart disease and dementia and I was slowly following the same path. One year ago I decided that I would do whatever it takes to not be like them and discovered keto and intermittent fasting. My brain and skin are now clearer, I’ve lost 10 kg and for the first time in my life at the age of 44 I have great cholesterol, blood pressure, heart rate, liver, glucose and vitamin D levels. My psoriasis and inflammation are gone, I sleep better and have more energy. But my body fat percentage measured by a Tanita scale has plateaued at around 32%. Last year when I began eating keto, it was around 38%. My goal is to be in the "normal range" but if everything else is great, should I just ignore the body fat percentage? 2. Does eating ketogenic reduce your desire for consuming alcoholic beverages? Thanks for your podcast and the Clarity books. I'm 8 days into eating 20 grams of carbs and moderate protein and feeling great. Interestingly, my habitual hankering for a glass of wine or vodka soda at 5PM has totally vanished. I haven't heard about this effect anywhere. Have you guys heard of this? 3. Can taking blood pressure-lowering medications negatively impact ketone levels? Do blood pressure medications, such as thiazides as diuretics, impact my ketogenic diet in any way? I know that these drugs have a tendency to spike blood sugars and assume that would mean they would be detrimental to getting into ketosis. 4. Should you cut your meals in half to minimize the negative impact of protein on ketosis? I was wondering if cutting meals in half and spacing them out by a couple hours is good for keeping the protein lower in one sitting. I make an omelet with 27g of protein, 55g fat, and 1g carb and I eat half and then save the other half for three hours later because I'm not sure whether or not that's too much protein at one time. Any advice on this would be awesome! Love you guys and your podcast. You are changing a multitude of lives. I’ve read Keto Clarity and many other books about ketosis, but I’ve still got questions about protein. Here’s the deal. For my height of 5’6” and age of 65, I should be getting in around 80 grams a day. But what happens when I’m not hungry, which is not unusual when you are keto-adapted, and I only end up eating one meal in a day. Am I supposed to eat all 80 grams in that one meal? That’s a lotta protein as well as a lot of food to try and choke down. 5. Does eating keto make your blood pressure drop too low and what can you do about it? I'm eating ketogenic and have been experiencing what I thought was brain fog which turns out to be low blood pressure. A friend recommended I measure my BP and it was 106/66 yesterday. I stopped at a pharmacy on the drive in to work this morning (the feeling is most noticeable when I am driving) and measured three more times with readings of 114/72, 108/66, and 107/63. I tried supplementing with salt tablets to see if that would help, but this didn't make me feel any better and my hands and feet started swelling. I've always had perfect blood pressure before starting keto. Other than adding more salt to my diet, are there any other ways to increase my blood pressure to a more normal range? I don't want to abandon this way of eating, but if carbs are going to make me feel better I may have to. 6. Why are my triglycerides high while eating a ketogenic diet? Hi Jimmy and Adam! I've really been enjoying your Keto Talk show! I've been doing a zero-carb keto for four months. I'm feeling great and really enjoying it. However, my triglycerides are high at 180. My other parameters are all good. Fasting blood glucose is 60, morning blood ketones are between 3.0-5.0 mmol, HDL is over 50, blood pressure is 98/73. Are my trigs high because I'm underweight and have been losing weight? My body fat is just 14.9% and my BMI is 17. 7. Why does my heart race whenever I consume saturated fat eating ketogenic? Can you guys talk about saturated fat just not agreeing with me? I noticed a high quality sugar-free chocolate bar with 22 grams of saturated fat would send my heart racing for 1-3 hours. Now I am leery of consuming anything with a high saturated fat content. I have mindfully used monounsaturated fat oils like avocado and macadamia nut oil and really noticed this disappear completely. I get the rest of my fat from avocados, macadamias and pecans, and heavy cream as I tolerate dairy very well. I had a comprehensive food allergy testing done and nothing came back with a sensitivity. When I attempted to have a tablespoon chunk of cream cheese on my avocado, the same thing emerged with a racing heart for a couple of hours. The same thing happened with a couple of tablespoons of grass-fed butter. This seems to show up within minutes of ingesting saturated fat. Keto has changed my life, giving me outstanding energy and stamina, much improved sleep, and a mental clarity never experienced before. Am I just stuck only eating monounsaturated fats on my ketogenic diet? You guys are beyond awesome! Thank you both for your all the wisdom you share weekly. 8. What are the exact signs I am looking for that show I’m fully keto-adapted? I’m a nutritionist who was a vegetarian for years and most recently Paleo and now here I am doing keto. I have a blood ketone meter and have ketone readings consistently between 1-3. I’ve been at it for a couple of weeks now and in excellent health. What I want to know is what the exact signs are that am I looking for in my body or blood ketone levels to make sure I am fully keto-adapted? 9. Why is my weight loss so slow while eating keto? I am a new listener to your wonderful podcast and love it. I look forward to every episode. I’m a lifelong dieter losing and gaining the same 70 pounds or so many times. I love the keto diet and believe in it since beginning it in February. I have only lost 18 pounds while my husband has lost 65. I know I shouldn't compare myself to him, but I wonder if the reason I am going pretty slow on this is that my body is saying "yeah, right. Here we go again." I keep track of my macros as I keep a food diary. This so-called uncomplicated way of eating has become a very complicated way of eating for me. I am staying under 20g of carbs daily. I do enjoy a daily diet soda and I have a fairly sedentary lifestyle. I will admit I don't think I have been as faithful as I should be from time to time as unfortunately my carb cravings really haven't subsided. I find myself hungry often. I am 56 years old and post-menopausal. I use urine ketone test strips and I have NEVER registered as anything other than "trace." Is it possible I not only have never obtained ketosis, let alone become keto-adapted? Any advice? 10. Is percentage of carbs or the number of carbs most important to get into ketosis? I love your show for all the good advice and knowledge you share. My question is about carb intake. I am currently struggling with the amount of carbs to take in. Currently I'm consuming about 50-70 grams of total carbs a day and if you subtract fiber it would be more like 30-50 grams of carbs a day. I'm active lifting 5 times a week and run or bike another 3 times and am wondering if carb percentage is more important (I'm currently at 10% of calories in my diet) or the 50-gram mark? Any suggestions about this? Am I doing this all wrong? Thanks for your time and looking forward to your answer. If this helps, most days when I test my ketones with the Ketonix I'm in the green. 11. Is there any connection between a ketogenic diet and cystic fibrosis? Any information about Ketogenic and Cystic Fibrosis? 12. Are there some people who can’t tolerate eating a high-fat diet? Hello Jimmy & the Doc! I'm a huge fan! If podcasters had groupies, I would be that groupie with you guys. You've helped me tremendously, most recently, in convincing my husband that we needed to slow down on the peanut butter! Here's my weird question I haven't encountered anyone else talking about this who didn't have their issues resolved by "giving it time" or by taking some kind of bile or enzyme supplement, so I'm a little worried. My gallbladder was removed several years ago. When I first started eating keto, I had some loose stools that evened out more or less as I continued this lifestyle. Then it came back, and it was so much worse. I'm not sure if I can identify exactly when it returned, but it seems I'm not digesting anything anymore and my weight loss has stalled. The last 8 months or so have been very high stress, so I'm ashamed to admit I fell off the wagon a few times for a few weeks at a time. The liquid bowel movements would stop in those periods when I was back on carbs. I take an ox bile supplement with most of my meals. I eat grass-fed gelatin on an almost-daily basis to work on repairing my gut. I eat plenty of greens and drink plenty of water. I've cut out most supplements to try to figure out if one of those was the culprit. I quit dairy for several weeks, no change. Thanks again for your time and all that you do. You're literally making the world a better place.